The wooden 30 meter long Oktavia Thailand liveaboard has a beam of 6.5 meters. This well-run liveaboard dives Similan, Koh Bon, Koh Tachai and Richelieu Rock with various liveaboard safari lengths from two to five-days. She carries plenty of fresh water and fuel to enable her to easily conduct week-long Thailand liveaboard scuba diving itineraries. Guests dive from two RBI tender dinghies for safety and comfort. Oktavia liveaboard carries safety equipment for safe passage at sea including first aid kits, Oxygen, a DAN oxygen kit, two SOLAS life rafts, and SOLAS life jackets. Her communication gear includes VHF radios, CB radios, a GPS, radar, echo sounder and mobile telephones. She offers Nitrox. She has both indoor and outdoor comfortable saloon common areas. 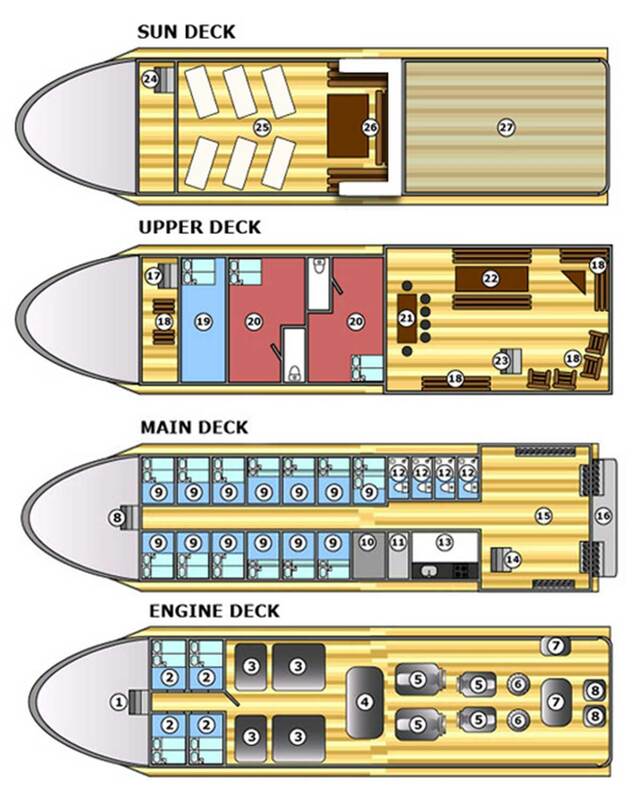 Oktavia liveaboard has two master cabins located on the top deck. These are en suite and air conditioned. They feature a large king sized bed, a desk and seating area with two comfortable chairs, and a flat screen TV with media option. We can also put extra beds in the room for your children up to 13 years old. A family of four can easily be comfortable in this cabin for five days. She has 10 standard cabins confirmed either as a single double bed, or twin beds in bunk style. Two of the cabins have triple berths with a double bed below and a twin bed above. These cabins are also suitable for families. They are air conditioned and the very large shared bathrooms are just down the hall where you may shower in comfort. There are also showers on the dive deck. Oktavia liveaboard operates in Thailand from October until May each year. Her trips are five-days and five-nights in length exploring Similan, Koh Bon, Koh Tachai, Richelieu Rock and the Surin Islands. These liveaboard dive trips can be split up to accommodate guests with less time on their hands. Her two-day trips visit only the Similan Islands. You will join Oktavia liveaboard for the trip out, and return to Thap Lamu harbor by speedboat. Three day trips visit Koh Bon, Koh Tachai and Richelieu Rock. You travel to the boat by speedboat from Thap Lamu and return on the Oktavia liveaboard. She is available for individual bookings as well as charter cruises. Individual prices are listed below in the schedules. Please contact us for charter prices. All departures are from Khao Lak, Thailand, serviced by Phuket International Airport. Phuket hotel pick ups are available for a charge. The vessel departs from Thap Lamu, the port just south of Khao Lak. Transfers are arranged to and from your hotel or the airport to the boat on departure day. Families who dive together, stay together. On most liveaboard boats, divers come first and non-divers are ignored. On Oktavia it’s different. Oktavia has a separate diver and snorkeling program which means while the divers are diving, the snorkelers are snorkeling or visiting the beach with their own guide in their own dinghy support boat. Oktavia has both great diving and great snorkeling programs for families with non-diving spouses or kids. Just because she takes families the diving doesn’t suffer. The programs are separate with separate guides so everyone wins. Note: While you’re responsible for your own children, we do have a babysitter available for 2,000 baht per day. Please be realistic about how much care a babysitter can provide on a boat. As all parents are painfully aware, kids can sometimes be a bit fussy about the food. But is not a problem on the boat. At each meal we serve three or four different dishes, and kids can always find something they like. If not, we’ll fix something up! And, don’t forget, playing and swimming all day make most kids very hungry. As they say in Swedish, “hunger is the best spice.” In between meals, toast, fresh fruit, and snacks are always available. What about seasickness? During diving season in Thailand, we rarely, if ever have a ground swell. The only time we really have waves if it’s windy and it rarely gets very windy. At night we anchor in calm protected bays and underway, seasickness is rarely an issue. Normally kids are not bothered by the boat movement. And the best way to avoid seasickness is to treat it before it happens by staying hydrated and making sure you don’t wait too long between meals. We also have safe medications on board. 14:00 Phuket hotel and airport pick ups. Charges apply. 17:30 Transfers to Phuket hotels. Charges apply. Please note: Approximately 7 dives. Itineraries are for general information only. We make no claims to being 100% accurate as there are too many factors affecting the schedule. We will give you the best diving on the best spots we can each day. Diving Boonsung Wreck or Koh Bon. Depart for Thap Lamu Harbor. 17:30 Transfers to Khao Lak. Please note: Approximately 9 dives. Itineraries are for general information only. We make no claims to being 100% accurate as there are too many factors affecting the schedule. We will give you the best diving on the best spots we can each day.